Soviet soldier examines German Pz.Kpfw. III Ausf. 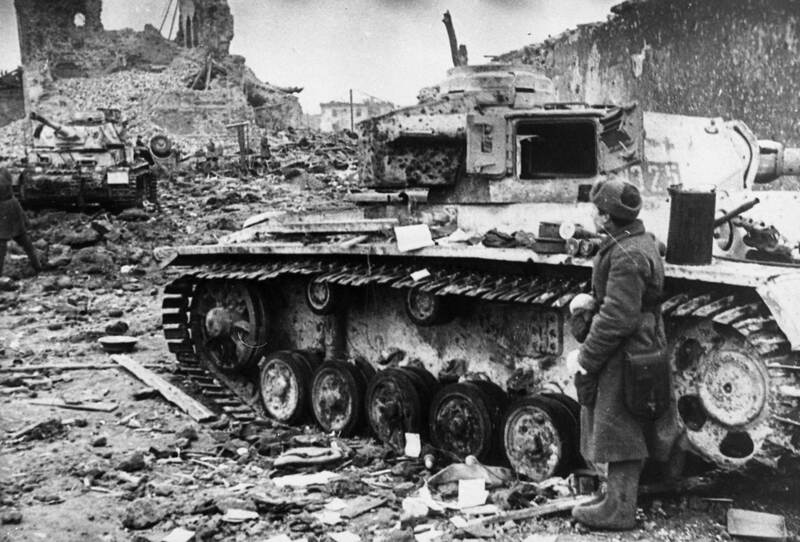 L medium tank of 18 Panzer Division of Wehrmacht, abandoned in the Battle of Velikiye Luki among the ruins of the city. The Nazi armored vehicle is painted white over the base Schwarzgrau (dark gray) and has special winter tracks that reduce the pressure on the ground. In the background is another destroyed German medium tank (presumably Pz.Kpfw. IV). During the Velikoluksky offensive operation on November 24, 1942 – January 21, 1943, in the vicinity of Velikiye Luki, a group of German troops was surrounded and after stubborn fighting on January 17, 1943, the 7,000th German garrison was destroyed and the city was liberated by Soviet troops. Source: Estonian History Museum (EAM) / N17202.